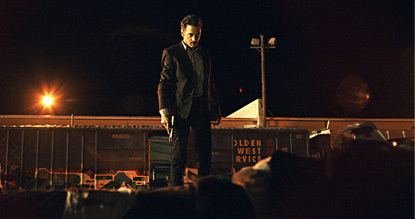 Respected character actor John Hawkes is given a chance to shine in this gratifying sunshine-noir detective thriller. This is a pulpy noir with a dark sense of humour and a great central performance from John Hawkes (driving a hella-noisy Death Proof car). He gets a solid assist from Clifton Collins Jr (who goes through a great arc from sinister pimp to amusingly juiced sidekick), Robert Forster (who’s always watchable), and a croaky Father Christmas-style villain with orthopaedic shoes. The locals are well fleshed out (even the bar lady has a great scene involving a badge), and the town feels populated (not so common in lower budget thrillers). The narrative (with shades of Payback, Dirty Harry, the Coen Brothers and Shane Black) builds nicely and hits all the right notes. It’s visually straightforward and doesn’t break new ground or have a distinctive voice but Small Town Crime is completely satisfying and likeable. Small Town Crime will be available on Netflix in early 2018.